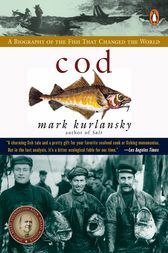 Cod, Mark Kurlansky’s third work of nonfiction and winner of the 1999 James Beard Award, is the biography of a single species of fish, but it may as well be a world history with this humble fish as its recurring main character. Cod, it turns out, is the reason Europeans set sail across the Atlantic, and it is the only reason they could. What did the Vikings eat in icy Greenland and on the five expeditions to America recorded in the Icelandic sagas? Cod, frozen and dried in the frosty air, then broken into pieces and eaten like hardtack. What was the staple of the medieval diet? Cod again, sold salted by the Basques, an enigmatic people with a mysterious, unlimited supply of cod. As we make our way through the centuries of cod history, we also find a delicious legacy of recipes, and the tragic story of environmental failure, of depleted fishing stocks where once their numbers were legendary. In this lovely, thoughtful history, Mark Kurlansky ponders the question: Is the fish that changed the world forever changed by the world's folly?